Paul’s persuasion was founded in Jesus Christ, and that helped Paul to be even more determined, because it helped to bring him to victory. Paul was persuaded to the point of death because he saw that he was unworthy of such a noble calling to be an Apostle of Jesus Christ. He saw a risen Jesus on Damascus Road, He heard the command to join Him, he believed his calling, despite what others thought about him. Have you ever done something so wrong that if it ever got out in the open, you felt you would be in big trouble and never forgiven? Paul did. He was on a death binge against the Early Church, convinced that what he was doing was right because he had the direct support of the religious leaders. Paul was on his way through Damascus when he would run into a series of events that would forever change his life. He met Jesus. What a radical change of persuasion Paul went through. from a murderer of the followers of Jesus to a persuader that Jesus was worth dying for. Paul was persuaded that Jesus Christ would not leave him, and that he would not be allowed to leave Christ, and this stirred him up to deeds of daring. Where there is real cause for fighting, there cannot be victory without striving! Paul was so persuaded that Jesus Christ would never leave him that he became a fighter, and he went in with all his might against the world, the flesh, and the devil. Paul had been persuaded by his own experience of suffering unto Jesus Christ. Paul suffered scorn, scandal, pain of body, depression of spirit. “A night and a day” Paul said, “I have been in the deep”. Paul is persuaded that they are not able to separate us……and yet these are the strongest forces imaginable- Death, Life, Angels, Principalities, Powers. Paul summons all our foes in this life, and sets them in battle array against us. And when he has added up the total of all their worth, he says that he is persuaded that they are not able…. 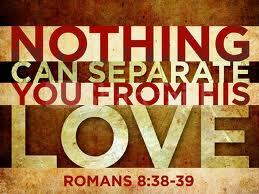 to separate us from the love of God which is in Christ Jesus our Lord! This passage really hit home with me, listening to Paul go through all the enemies he was facing on a daily basis: Death, Life, Angels, Principalities, Powers. I am facing my daily enemy in the form of 8 chemotherapy pills a day, with a one day drip concentrate that makes me feel like some of things Paul was talking about. Specifically the one about being shipwrecked. But one thing I do, is take passages of Scripture like this one and make it my badge of honor, that I can say by days end that my persuasion is to be founded in Jesus Christ, to be found in Him as I lay my head down at night to sleep. I want to be determined in this because if it helped to bring Paul to victory, I want the same. What is your persuasion? What are you bound and determined to do with what Christ has given you? Can you say that whatever the enemies that come in battle array against you that none of it will separate you from the love of God, in Christ Jesus. If you were given an untimely report, that would challenge your faith in such a way as Paul’s, and say at day’s end that the victory has already been had in Jesus Christ, and that……is enough for me; no matter what. Next The Faithfulness of God…….